Barbara Edwards Contemporary, Toronto is pleased to present an exhibition by celebrated Canadian artist and architect Melvin Charney. Considered a champion for the public role of the architect, Charney made significant artistic contributions to Canada’s public spaces. This retrospective is in conjunction with an exhibition of Charney’s work at Art Mûr, Montreal (8 March – 26 April) and an exhibition at Barbara Edwards Contemporary, Calgary (7 February – 15 March) as part of the Exposure Photography Festival. Born in Montréal, Charney studied art under Arthur Lismer of the Group of Seven. He received his Masters at Yale University School of Art and Architecture where he studied under Willem de Kooning and Walker Evans. After his return to Montreal, Charney became one of the founding professors of the architectural department at the Université de Montréal. Charney’s work gained international recognition with his proposal for the Canadian Pavilion at the 1970 Osaka World Fair. Among Charney’s most notable works are the Sculpture Garden at the Canadian Centre of Architecture in Montréal, and the Canadian Tribute to Human Rights sculpture in Ottawa, unveiled by the Dalai Lama in 1990 as the world’s first monument to universal human rights. 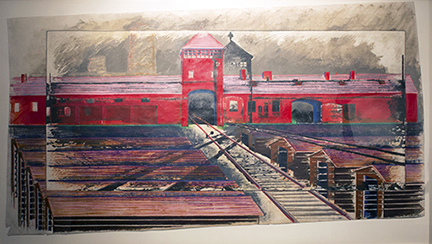 Charney’s works have been exhibited in notable public institutions including the Museum of Contemporary Art, Chicago; P.S.1, New York; the Centre Pompidou, Paris; the Akademie der Künste, Berlin; the National Museum of Contemporary Art, Seoul Korea; the National Gallery of Canada, Ottawa; the Musée des Beaux-Arts, Montréal; the Art Gallery of Ontario, Toronto; and the Vancouver Art Gallery, BC. Melvin Charney was the recipient of many honours including the Prix Paul-Émile Borduas; fellowship in the Royal Architectural Institute of Canada; membership in the Canadian Royal Academy of the Arts; and an Honorary Doctorate from McGill University. 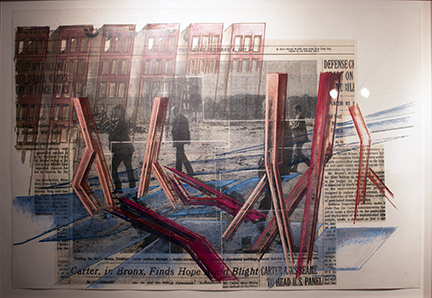 Charney represented Canada at the Venice Biennale for Art and Architecture in 1986 and 2000.
colour pencil and ink on vellum, 34.6" x 82.9"
pastel on a laser print of a newspaper photograph mounted on paper, 48" x 84"
oil pastel on gelatin silver print, 25" x 55"